Do you want to make perfect artisan bread at the comfort of your own home? Besides having a good bread recipe, you will need to have a bread proofing basket or banneton (also referred to as brotform) to proof the dough. 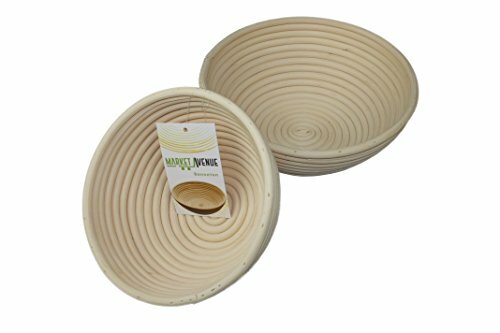 These bowls are designed to create a thin skin around the dough that creates a wonderful crust when baking. The rings inside the bowl make it easy for the proofed dough to easily come out just by flipping it over. A banneton is very simple to use. Just give it a good dusting of flour to make sure each nook and cranny has a layer of flour. Then place your dough on top, and cover the bowl with a cloth linen or towel. Once your are done proofing your dough, just flip over on to your pan or peel and you are ready to bake! No washing or clean up is required, as the wood these bowls are made from has natural antimicrobial properties. This package comes with two bowl sizes: 7" and 8.5" for handling medium to large amounts of dough. If you have any questions about this product by Market Avenue, contact us by completing and submitting the form below. If you are looking for a specif part number, please include it with your message.